This project has developed over the last twenty-two months beginning when we first invited the public into our archive to explore and develop the material, culminating in six diverse websites. 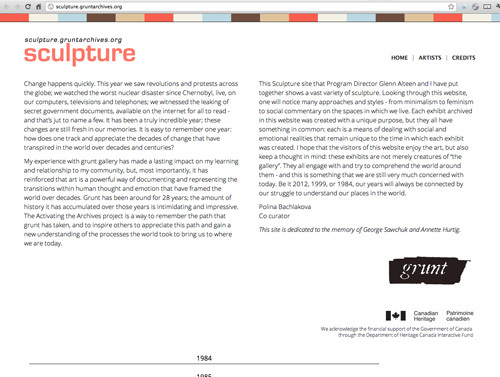 The response to this project has been overwhelming, beginning with the exhibition in the summer of 2010 and leading to the 25+ individuals who came to work on various elements of the project including archiving, curating, digitizing, and designing. Working on this project has been a very exciting journey. Through the eyes of younger artists, curators, and art historians, our archive has come to life in unexpected ways. Having worked at grunt for the past twenty-eight years I was pretty sure I knew the archive, having had a hand in the production or presentation of most of the work in it; however, through these fresh eyes a transformation was achieved. What they saw and how they used the archive allowed for a reinterpretation -- finding work that was overlooked and making connections that I never saw. The other part of this project is the database of artists and the Activation Map, which allows the user to start a web page and populate it with selections from our database. 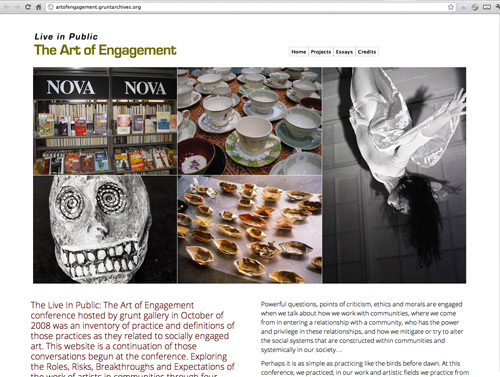 These pages can be streamed allowing for curatorial selection and classroom use or simply re-mashing works in exhibitions. There are many people and groups to thank here; where to start. A big thank you must go to Heritage Canada for their support of this project. 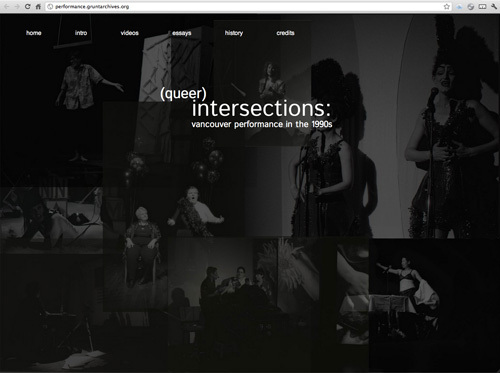 The Canada Interactive Fund made this project possible coupled with support from a host of sources as follows: The Canada Council, BC Arts Council, the City of Vancouver, Sask Arts Board, ArtsFACT, the Vancouver Foundation, and Rick Ericson, as well as support from a host of institutions including VTape, TRIBE, VIVO, Western Front, On Main, The National Gallery of Canada, The Banff Centre, Neutral Ground, and SFU. Thank you to all for your generous contributions. The project brought together a team of people, some of whom we had worked with before, including the following: Archer Pechawis, Tania Willard, Dana Claxton, Daina Warren, Venge Dixon, Pat Beaton, Paula Jardine, Hillary Wood, Merle Addison, and Steven Tong. 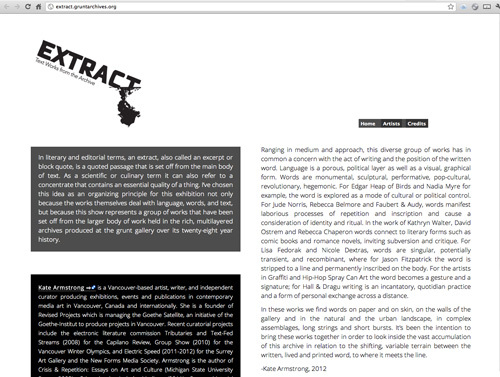 Many of these artists have worked for grunt in various capacities for over twenty years, and all have been core contributors over this period. Thank you all for your ongoing support. Also making this project possible is the support through new faces and new blood as listed here: Malcolm Levy, Brian Gotro, Kate Armstrong, Christine Stoddard, Polina Bachlakova, Dan Pon, Zoe Tissandier, Olga Alexandru, Jessica Mach, Diana Zapata, Kendra McLellan, Joi Arcand, Jennifer Campbell, and D’Arcy O’Connor. Thank you all for your work and your dedication to seeing this project through to completion. We look forward to working with all of you again. The programming support of Mainsocial and their team of Ben Nevile, Alana Scott, and Ginger Ngo, and the design and programming by All Nations Media (Archer Pechawis), were essential to the production of this project. In all instances their ability to listen, develop, and adapt throughout this project has been vital to its success. Thank you for your support. Finally, thank you to the administrative support of Cornelia Wyngaarden, and grunt staff and contractors, Meagan Kus, Linda Gorrie, and Mary Ann Anderson. Demian Petryshyn’s marketing plan and development with his team of Francois Roux, Adrienne Greyeyes, Diana Zapata, Olga Alexandru, Jessica Mach, Dan Pon, Sonia Hebert, Sylvana d’Angelo, and Alexander Pimm has given this project, both its process and its product, a life in social media. I thank all the aforementioned for their work under sometimes stressful conditions. And thank you to the board at grunt for their support and input. 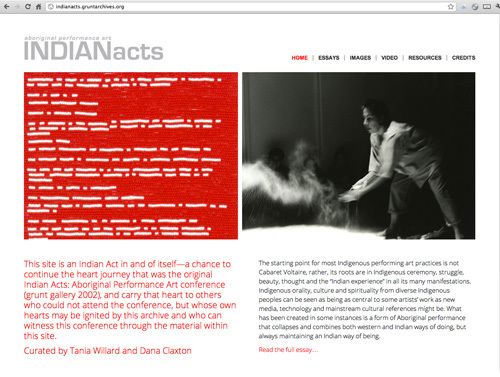 Activating the Archive is a legacy project in many ways culminating our twenty-eight years of history into the digital age and laying bare some of the curatorial concerns and developments that have galvanized our reputation over this period. 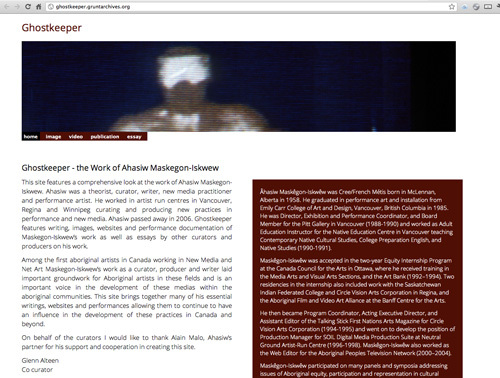 Much of the work harks back to an earlier era in Vancouver when art did not have the profile it does now, exhibitions in artists centres were seldom reviewed except in art magazines, and many of our events and exhibitions were experienced by smaller audiences as most ran for only a couple of weeks. Through Activating the Archive, many of these projects will receive more attention and bigger audiences than the original events had. Finally I need to thank Lorna Brown for her thoughtful essay on archives in artist- run centres. It serves as a wonderful introduction to what we are trying to do here. 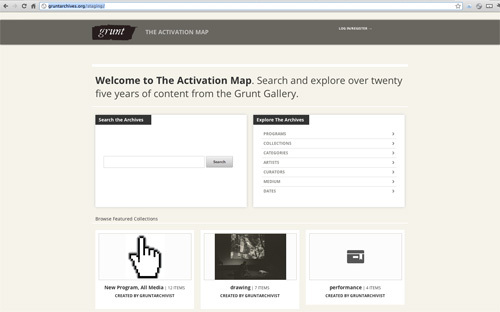 Activating the Archive furthers our explorations into archives and curated digital resources. We will continue to develop projects that bring visual art into the media world. Thank you for your interest and support. Enjoy and tell your friends.